Your old dental crowns, bridges, and gold fillings indeed have value! There is a market for old dental gold, crowns, bridges and even the dental gold sheets before they are fabricated into dental work., so if your unwanted dental gold in Chicago is just tucked away in a drawer somewhere, you have something of value. If you have dental gold and want to sell unwanted gold in Chicago, here is what you should do: Bring it into Chicago Gold Gallery where our experts can determine the value of your dental gold. 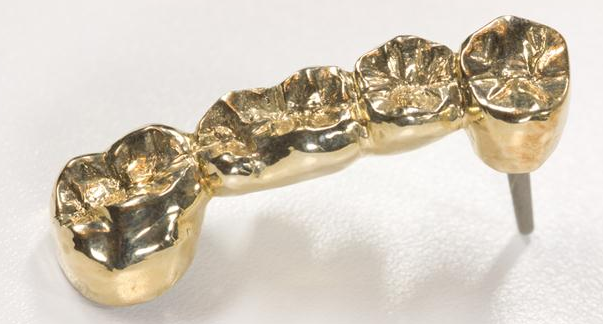 The value of the dental gold is determined & based on the amount of precious metal it contains. This depends on the weight/size of the crown or bridge and the type of karat gold & alloy used to make the crown. The classification of alloy can add a lot of variation to your crown’s value. Dental alloys can either contain precious metals, semi-precious metals, or non-precious metals. The amount of gold in your crown is dependent on which classification it belongs to. Dental patients more than likely have minimal information on what type of gold was used for their dental work. You can visit a professional gold buyer in Chicago at Chicago Gold Gallery. Your dentist may have given you paperwork that is likely to refer to the category of the alloy. If you want to sell your dental gold crowns, fillings, and bridges or sell unwanted gold in Chicago, visit Chicago Gold Gallery. At Chicago Gold Gallery, you will be selling to a gold buyer with 38 years of experience. Work with a gold buyer that is knowledgeable about the industry, helpful, and passionate about gold & precious metals.